Home / Blog / Can You Recycle Rusted Metals? Can You Recycle Rusted Metals? Do you have old car components that have been sitting outside for a while? Perhaps you have old, worn-down fencing or piping? In any case, you likely have a large heap of rusted out scrap metal on your hands. So if you’re asking yourself – can rusted metal be recycled? The answer is generally “yes”. Rust is a common name for a chemical compound known as iron oxide. This compound forms when iron reacts with water and oxygen, presenting itself as a rough, orange-red substance. Rust can be removed from metal using household products like lemon juice, baking soda, vinegar and steel wool, or you can purchase chemicals to remove it. You can also coat metals ahead of time to prevent rusting. 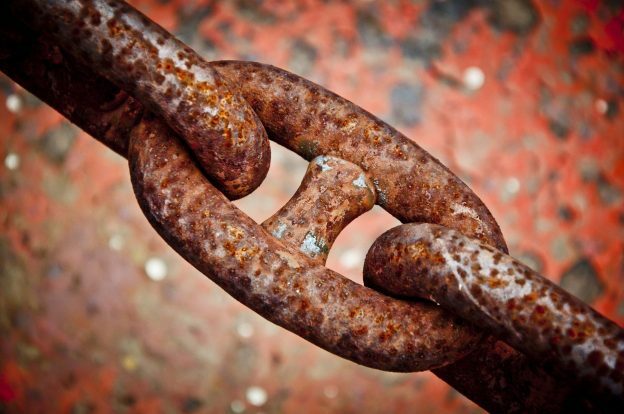 If rust is left untreated, it can corrode through all the metal in your products and create holes, which will weaken the strength of these products. You probably wouldn’t want to sit in a chair or ride a bike with holes in the frame. When iron is first extracted from the earth, it is in an oxidized form known as ore. The smelting process involves breaking any bonds created by oxygen and iron so it can be refined into metals like steel. To recycle rusted metal, you need to remove the oxygen again. In the recycling process for steel, the material is shredded and then melted to create new sheets of metal. If the rust is simply melted, it will re-form once the metal cools. That’s why the recycling process also includes purification, where elements like carbon can be added to bond with the oxygen and free the iron. This also removes other impurities like ink or dried paint. Most scrap metal yards will pay you by weight, and metal with severe rust damage will weigh less. Scrap metal accepted for recycling must be a majority made of metal, so if your product is half-metal and half-plastic and the metal corrodes away, it likely won’t be accepted as scrap metal. Coat any metals that are outside (e.g., fences, lawn furniture) to prevent rust in the first place. For reusable products (such as bicycles) with surface rust, use a natural product to remove rust and donate the product to a secondhand store or charity. If you have products with rust holes or other major rust damage, call a scrap recycler to confirm whether or not the product is recyclable before transporting it or arranging pickup. If you have any scrap metal on your hands – rusted or not, get in touch with Manville Recycling today for a quote. Or, if you’re unsure whether your rusted metal is recyclable, contact us and we’ll advise you the best we can. This entry was posted in Blog, Uncategorized and tagged auto recycling, metal recycling, Metal Recycling in Toronto, recycle ontario, rust, rusted metals on November 8, 2018 by Dev Support.